I travel to Goa once a month. The official reason is to maintain my ancestral property and, to offer a convenient option for my Goa-based patients for post-operative visits. 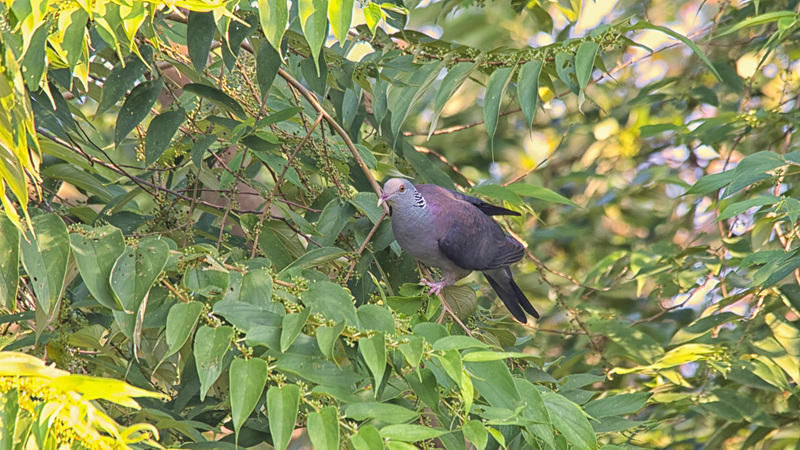 This arrangement is great because it also allows me to indulge in my hobby of bird and wildlife photography, apart, of course, from the opportunity to simply be in Goa! Truth be told, official and incidental reasons are quite interchangeable! 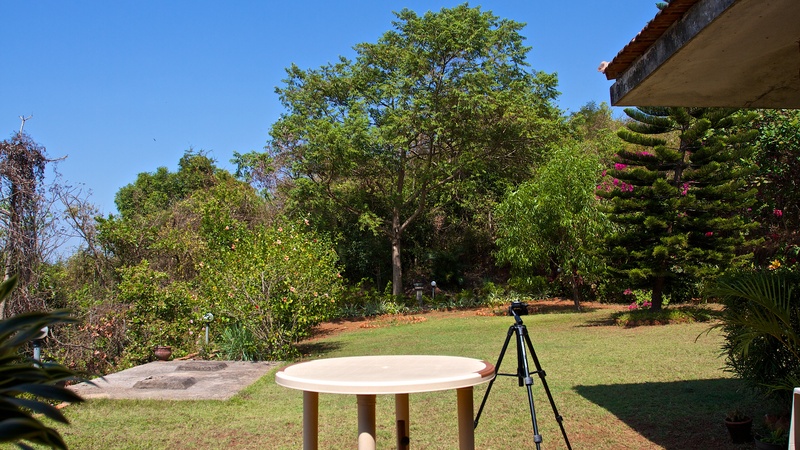 My farmhouse in Goa is situated in an area that is known for bird watching so most of my birding needs are satisfied right here in my backyard. There is this one tall evergreen tree at the far end of the yard that stands head and shoulders above all the others. Both in its stature as well as in its ability to attract birds. I’m not quite sure of its origin. I think my Dad planted it somewhere in the late ‘90s when the farmhouse was being built. I remember it as a tiny runt of a plant then, a far cry from the imposing, shady tree it is now. It’s commonly known as the Gunpowder tree and its botanical name is Trema orientalis. The tree flowers intermittently from late monsoon to well into summer. The flowers give way to clumps of tiny green berries that grow profusely on its branches and birds can’t seem to get enough of the fruit. This Sunday morning the tree is in its element! It’s packed with birds!! I arrive at the farmhouse at about 7.45am, and, as is my usual practice, I leave my camera bag and other paraphernalia in the car. Taking only the camera, I do a quiet recce around to the back of the house. This little exercise almost always throws up something exciting; a bunch of peacocks roosting on the roof, a Bhraminy kite perched atop a nearby palm, a snake coiled in the grill outside my back door. Today was no exception. 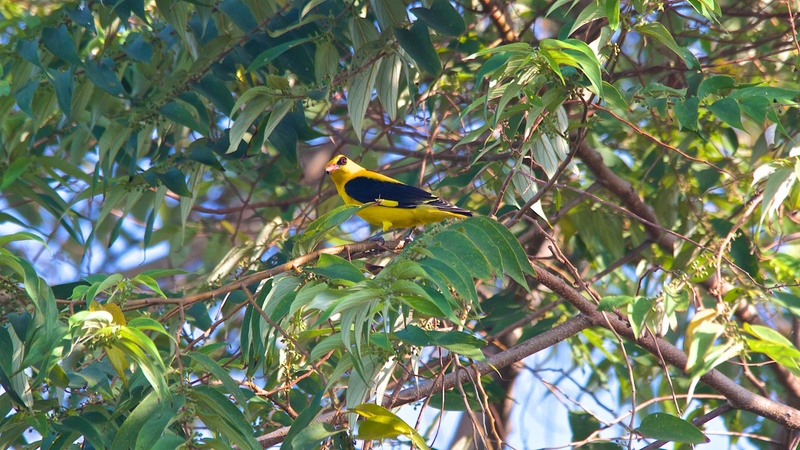 There must have been at least 10-15 golden orioles perched on the bare tree on the adjoining property! By the time I got the camera ready most of the birds flew away. The two that stayed however, were more than willing to pose while I clicked away! 8.05am: Time to unlock (cautiously; remember the python in the grill?!) and unpack. Laptop, card reader, memory cards, spare battery, macro and wide angle lenses are all laid out on the dining table for instant use before I step outside. By 8.20am I’m all set. Sitting out here the sense of peace is indescribable. It’s February and still chilly. A heady aroma from a mixture of wood smoke and garden flowers fills the air. From this high vantage point looking over the garden shrubbery towards the bottom of the hillI I can see a few peafowl grazing in the paddy fields which are still covered in places with wisps of early morning mist. Looking past the fields are dense plantations of palm trees, interspersed with the occasional house, church or chapel. And finally beyond the trees is the ocean, a thin sliver of blue before it merges with the horizon. The only sounds are those of the wind in the trees and the chirping of birds. In a matter of minutes, the stresses of everyday life, suffering patients, trafficated roads, you name it, begin to fade away. Between sips of coffee and intermittent bursts of the camera in motor drive I’m one happy trooper! And it’s on with the show! The stars of today are undoubtedly the Orioles. Normally they are only occasional visitors. Today they are here in hoards! It’s funny how nature spaces out her gifts, never revealing all at one time. Each trip has something different. Some species will suddenly show up in numbers on a particular outing having presented only the odd sighting both before and on subsequent visits. 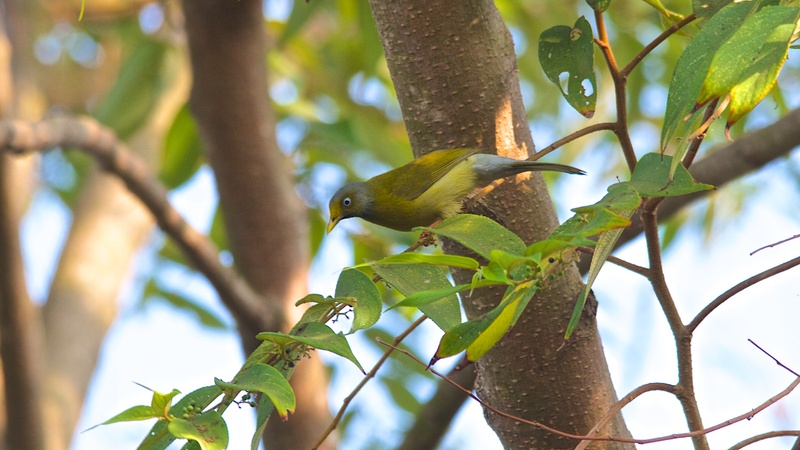 On my last trip here the gunpowder tree was chocker block with Pompadour green pigeons and Nilgiri wood pigeons! And for once they were not shy of me, allowing me to get quite close without flying away! Gorging on the fruit of the gunpowder tree on this particular Sunday morning, are an amazing arrays of birds. 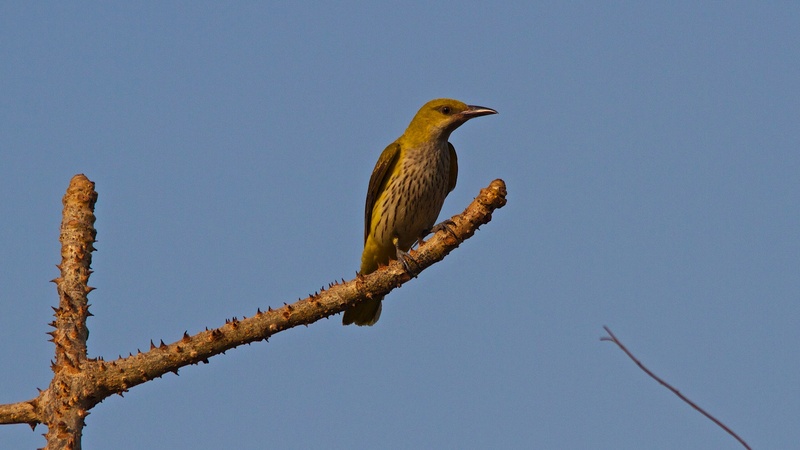 Bird species that I can identify include a number of bulbul species including Red whiskered bulbul, Red vented bulbul, White browed bulbul and, the near endangered, Grey headed bulbul. 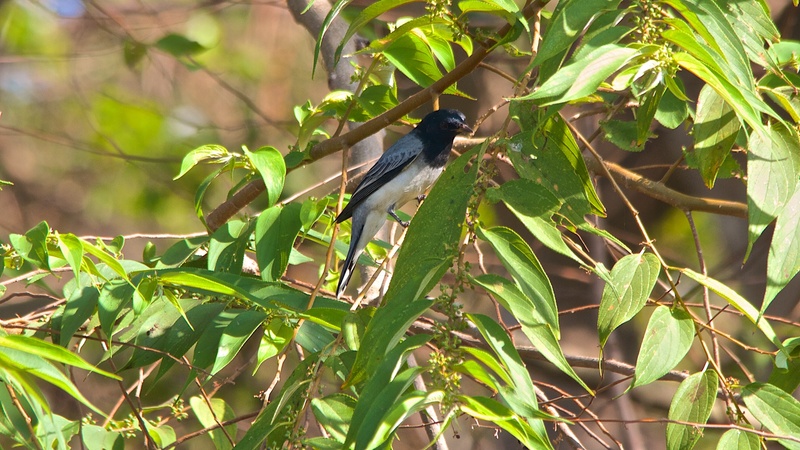 Other species include Purple sunbird, Loten’s sunbird, Tickell’s blue flycatcher, Asian paradise flycatcher (female), Indian golden oriole, Black hooded oriole, White cheeked barbet, Black headed cuckoo shrike, Orange-breasted thrush, Black throated munia, Ashy pirnia, Indian Robin, Magpie Robin and Ashy Drongo. As I sit quietly barely 30 yards away, the birds don’t seem to mind my presence. At any given time there are, without exaggeration, over a hundred birds populating the tree. All totally driven by one aim, and one aim alone: getting in as many berries as possible! Which leaves me with one major problem. That of trying to figure out which part of the tree to concentrate on so as not to miss a sighting or photo opportunity! All of a sudden there is a flurry of wings. All the birds fly out of the tree in a panic. Something or someone has spooked them. Was it me reaching for my coffee I wonder? 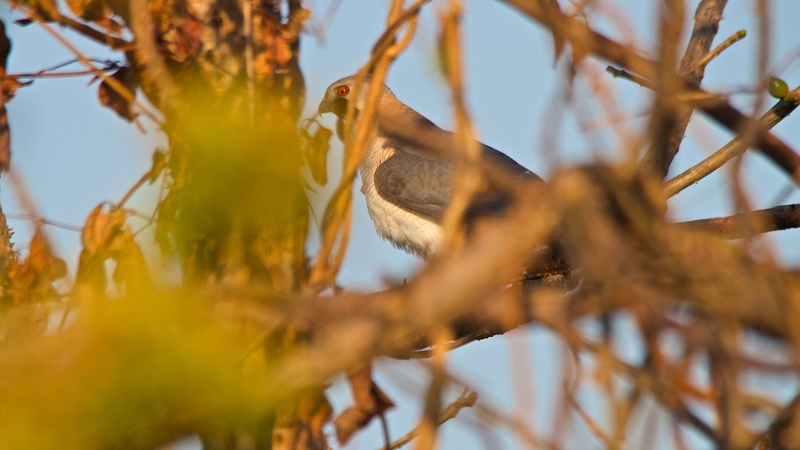 Seconds later a Shikra swoops out of the sky and alights onto a nearby cotton tree. I get a few shots off between branches before it flies away. From a photography point of view, shooting into a shady tree has its drawbacks. I often find myself shifting to manual mode, from my preferred aperture priority mode to improve my ‘keepers’. Although I must say that some of the birds are quite accommodating. 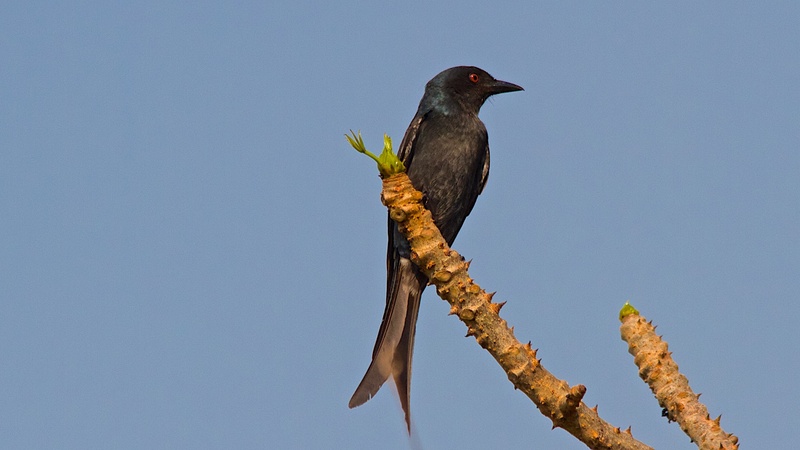 Like this drongo above who posed in the open before diving into tree to feast. 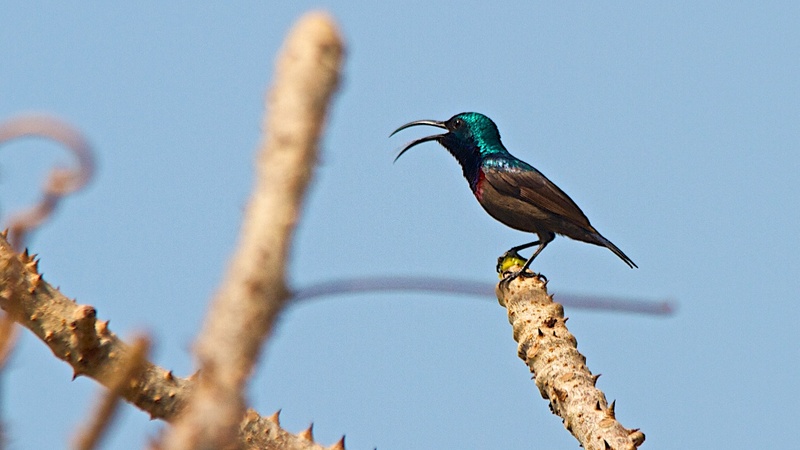 Or the Loten’s sunbird below. 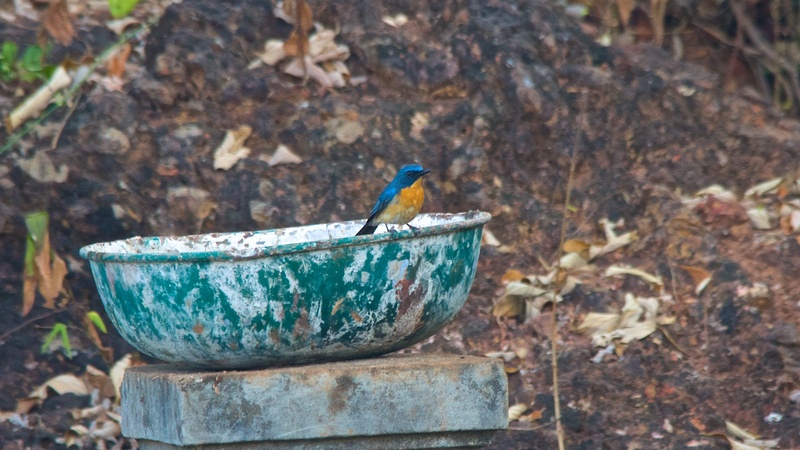 Photo opportunities are also to be had when birds hop over to the birdbath I keep at the foot of the tree. (This present birdbath is a make shift arrangement as the original cement one was broken, probably tipped over by an over weight peacock!) This Tickell’s Blue Flycatcher below does not seem to mind. 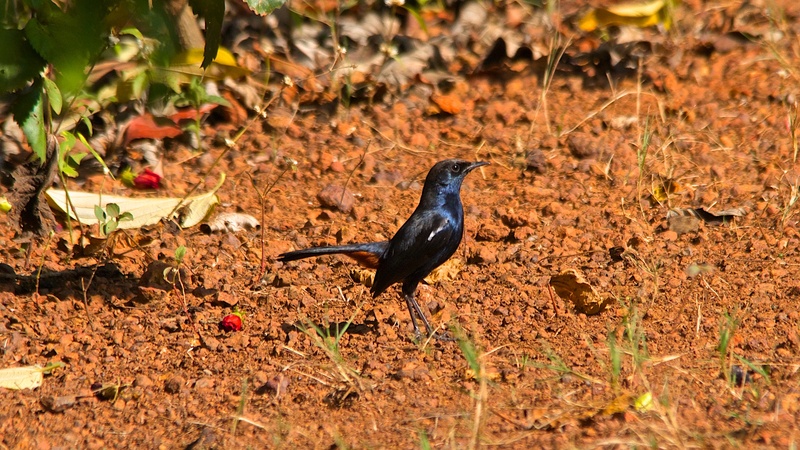 A pair of Indian Robins decided to try the non-vegetarian fare and hopped down to the ground to feast on worms and insects! …or an insect or butterfly would catch my fancy and I’d grab the macro lens to make the shot. The wasp below was dragging a large dead spider into a hole in the ground (its nest perhaps?). 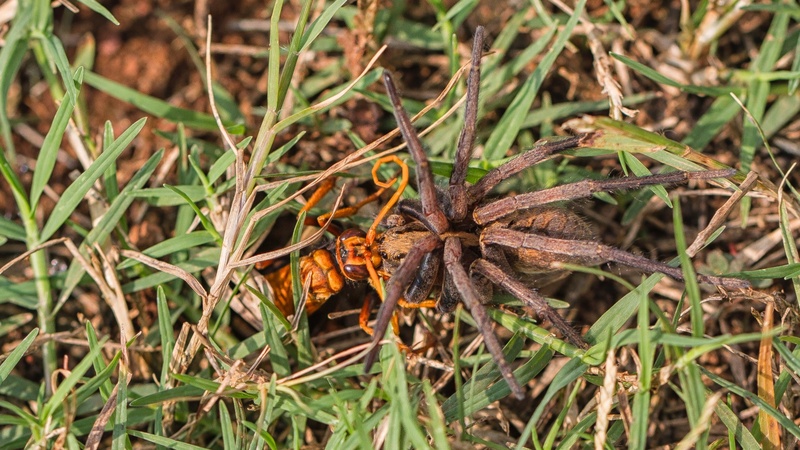 wasp dragging a dead spider into (?) its nest. And so the morning wears on and time flies! Before I know it I’ve run through two memory cards, changed my battery once, gone through two cups of coffee and done a few short trips down the driveway in an attempt to get the elusive fantails that I spotted when driving in. Thanks to which I have over a thousand images waiting to be edited on the laptop. Sitting here in this serene and peaceful setting I feel close to God. Privileged to have been given a grandstand seat to watch these beautiful creatures interact. So much so I almost feel guilty for even the intrusion caused by the clicks of my camera! And then, out of the blue, a reality check! I hear the ominous rumble of buses on the road at the foot of the hill. Minutes later the silence is shattered by loudspeakers in an amplified, prayerful roar. Shards of high-pitched reverent screams rip into the peace shredding it into a memory and I realise it’s my cue to pack up and move on. And while doing so I can’t help but wonder which end of the decibel scale it is that truely gets one closer to God. In Indian mythology, there is a tree called ‘kalpavriksha’ which means wish-fulfilling tree. For birders, this is IT! Thanks A. Carmen. Couldn’t agree more…although when the loudspeakers are in action there are a few other wishes I wouldn’t mind having fulfilled! Yes, the snake was very peaceful. In fact it was there for the entire day, both of us living in peaceful coexistence! He/she in the grill and I a few meters away taking images of birds in the Gunpowder tree! (Of course, not before I confirmed the harmless nature of the reptile by sending an image to Dr. Neil Soares, who assured me that it was a non poisonous, non aggressive species)!! In fact I clearly remember Dr. Neil telling me I can actually pick it up. And when I asked him if it would bite, he promptly replied that it very well might but I wouldn’t die from the bite!!! Needless to say I maintained my distance!!! Your posts are always so delightful, Sir. You are living the life that I dream of – staying in a farmhouse surrounded by birds and other wildlife. Do post more often! Yes, been a bit busy but am eager to do a photo walk in the near future. The photos are so clear and I am amazed at the variety of wild life on your property. Of course the creepy crawlers are definitely not on my ” like” list…ugh! Very insightful musings and why on earth can’t someone get those loud speakers barred from the vicinity…noise pollution is a very valid reason! Yes I too am amazed as each trip I do has something new! …and talking of God’s creatures…I think some of them should understand that using loud speakers does not earn one extra brownie points!! Dear Ian, thank you for sharing your whole experience with us! 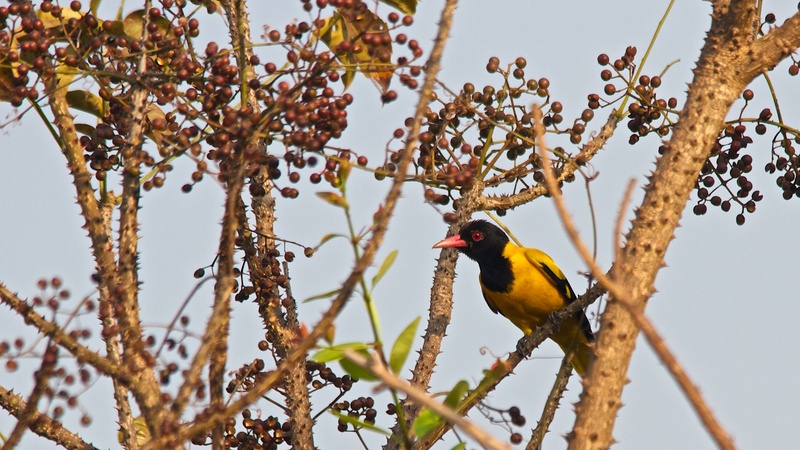 An amazingly well-written article, interspersed with spectacular pictures of the Gunpowder Tree providing food and shelter to so many species of birds! I am so glad you are living your dream…… you not only take care of your patients, but you make the time to enjoy your hobby and take care of your ancestral home as well..… congratulations!!!!!! 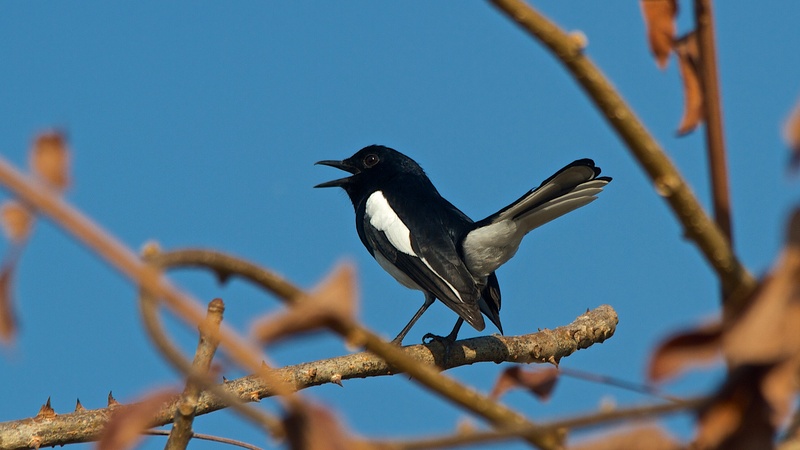 I had not realized there were so many different types of Bulbuls – many moons ago, when I worked at NOCIL, there were two of my colleagues who used to call me “Bulbul” – not sure why! I’m still in touch with one of them who lives in Delhi now, and he still calls me Bulbul – will ask him why one of these days….. ha! ha!!! Yes I am truly thankful and grateful for the opportunities I have got. I guess Dad is still pulling strings for me from up there!! 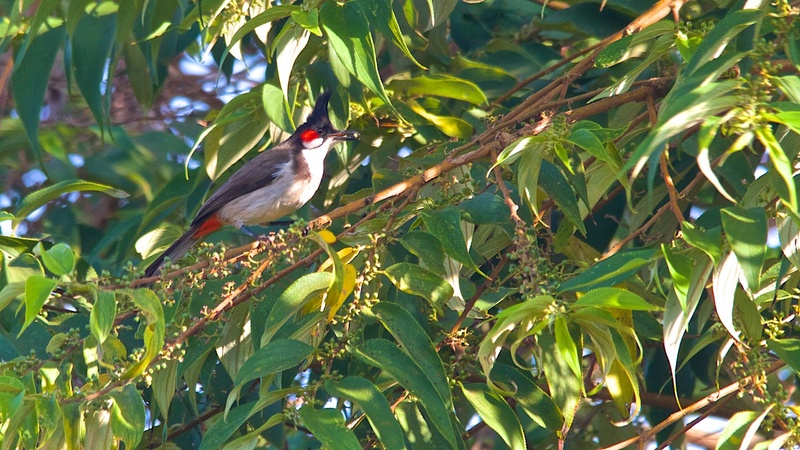 The bulbul is a very pretty bird so it’s no wonder that they called you bulbul. I’m only trying to figure out which one you are: the red whiskered or the red rumped?!!! Just kidding! Great connecting with you!! Great connecting with you too Ian. 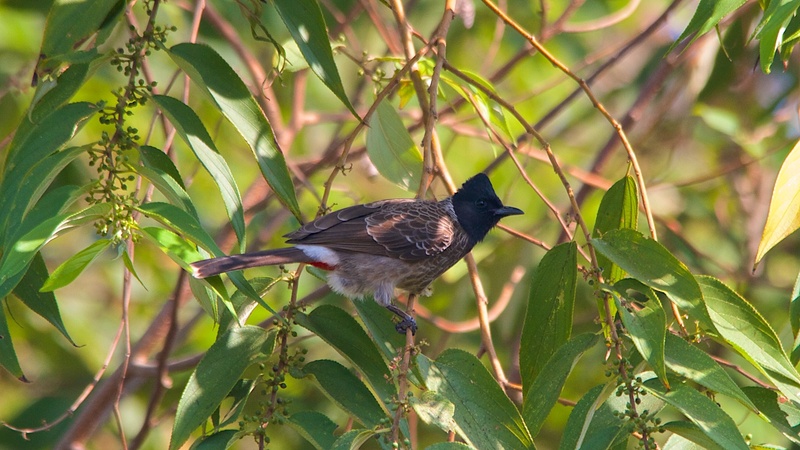 Well, may be I should settle for the red rumped bulbul???? Not sure I want to be “red whiskered”!!! Either way, I guess I would be male because the males of all the species of the animal kingdom are colorful and gorgeous…… whereas the human females often spend hours and a lot of money trying to look beautiful… ah well!!!! Take care Ian and keep enjoying your hobbies. Much love to you and your dear family. Knowing that you are at heart a kind person I assume you that you mean that I NEVER fail to amaze you! In which case… many thanks! BTW Loved your picture of the swan!! Beautifully written Ian. The landscape offers just captivating views…. and of course the birds are well… perfect models for the background! 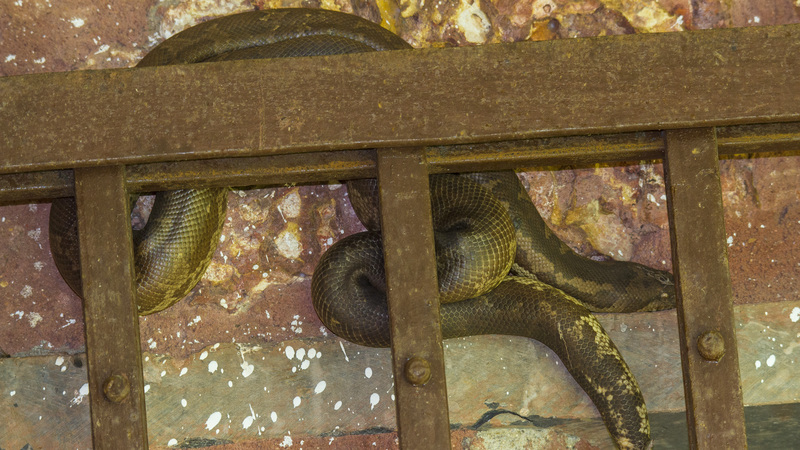 As for the reptile… I had to zip past that shot – eyes shut! :)! ‘The reptile’ seems to be the one bone of contention with many readers. …the liquid courage will have the creature eating out of their hands in no time! nice write up sir..i was feeling as if i was there in your farmhouse doing birding, such was the freeness and impact of this smooth narration. and amazing collection of species in one day. Many thanks Dr. Chandrashekar! Comments like yours really make my day!! My pleasure! Thank you for visiting and kind comments! Wonderful ! You are one lucky person who is making full use of the opportunities he is presented with. And the photos are exciting too. 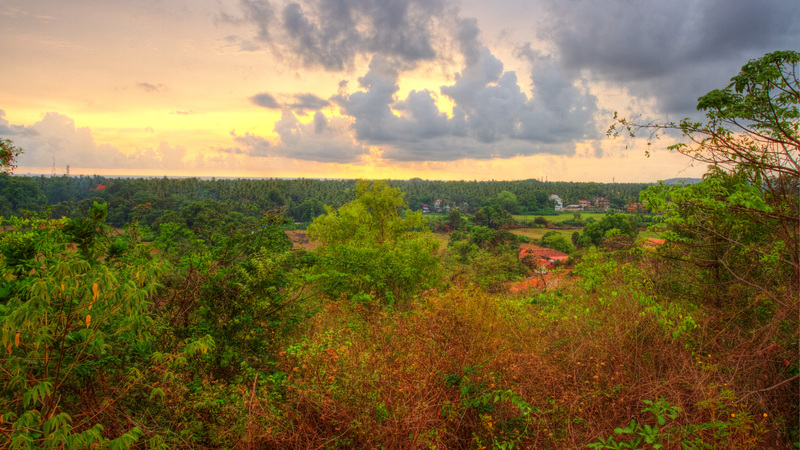 Interesting but not unusual that you are in such close proximity with nature and Goa. I do know, Goans are exceedingly proud of their home state, you have taken it a step forward bonding with the birds. Otherwise it is always booze and the beaches! Birds, booze, babes, beaches, breaking bread…and a Goan will ‘be’ in heaven!! All that aside, Dr. D’souza, thank you for such a brilliant piece of literature to compensate for all the images that have not been upped. Sooooo tempted to visit Goa myself and so hoping to get invited over to your beautiful place to see all the magnificent species, when you are around. I love nature, especially birds, and being a Bombayite myself, always long to be away from the hustle and bustle and the droll drudgery of the rat-race, in the arms of mother nature, anywhere that her magical creations fly about in abundance fearlessly. So far, its only every once in a while that it is possible. But everything notwithstanding, I am in awe of the diversity of you life from Onco-surgery to birding. I do hope that your posts inspire more earthlings to take up conservation in any which way possible, and help preserve our blue marble for generations to come. Thanks Ramesh.Rather than my posts I find your message inspiring! Thanks for your kind words and hopefully we can meet up in Goa some time! Excellent Blog. Congratulation. It is informative as well as interesting to read, I really like your style of writing. Totally agree with your views. The evolution of mankind is moving away from the Creator’s creation, in an effort to establish itself as a creator, forgetting that we will always be the creatures whatever we claim to achieve. 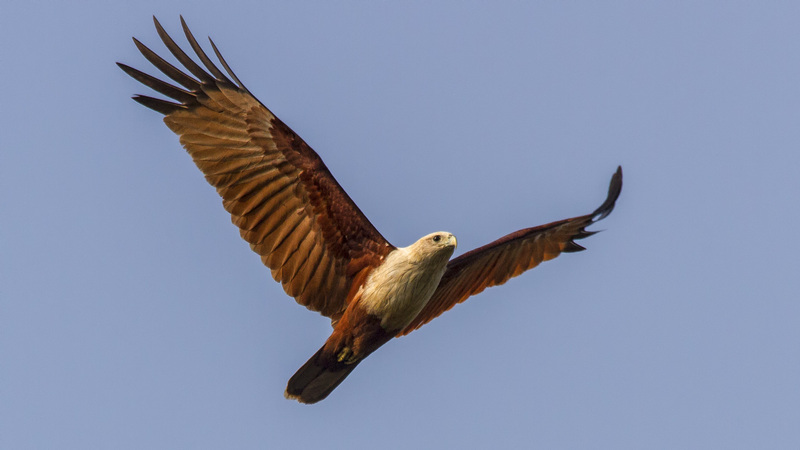 BTW, I also have been using the same lens since 2007, and have been facing the limitation particularly shooting moving objects – your Brahmini kite is cool! 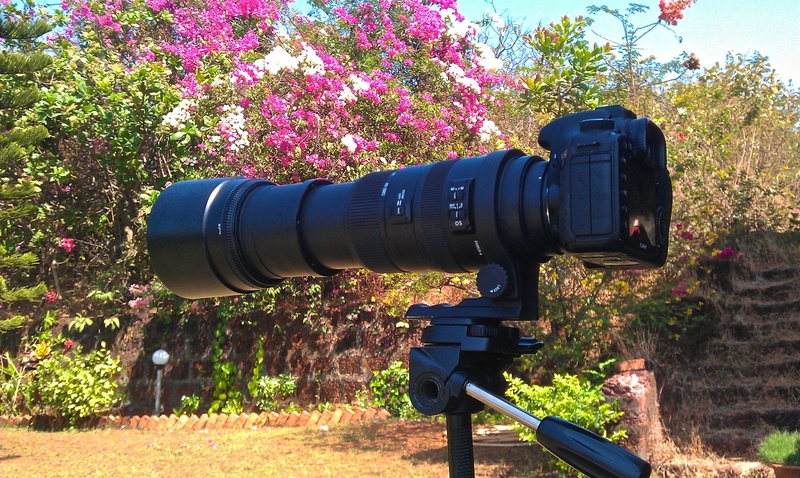 I’m want to move on to Canon 100-400 IS USM, but the Rupee fall has delayed it. Not sure whether it will move backwards soon. The Gunpoweder tree in your backyard is blessed to have such a variety of guests and so are you to be able to spend time among them. Look forward to your next blog and perhaps an opportunity to do birding together. Thanks Umesh for your kind comments.Yes, a lens upgrade is definitely on the cards and I’m busy considering my options. It would be great to meet up during a birding session…always a pleasure to connect with a fellow birder!! Fantastic photography Ian! You have a lot talent. Enjoyed the description of the pictures – you also have a fabulous view from your property…. I agree with Vanessa about the creepy crawlies! Ian- Such a delightful read.I have as many of these species here and the four legged kind too- raccoons, wolves, fox, bears- and the citizens do everything to respect and protect them.Perhaps with guilt that we are encroaching on their territory. Wonder who it is that is ” evolving”. Best wishes on your journey of discovery. Hi Hubert. Just got back from a fishing trip hence the delayed reply. I felt I was with you all along. Your place is a prescription for peace. Tfs. Thanks Solomon. You hit the nail on the head with ‘Your place is a prescription for peace’ statement! I find that whenever I get back from one of my trips I’m more restful, less irritable and more tolerant in my dealings with people both professionally and socially. Doctors seriously need to consider adding this to their pharmaceutical textbooks! !